Online marketing and lead generation are not easy - not if you are looking for targeted, motivated consumers at least. On top of that, consumers are more savvy and protective of their information than ever before. So how can businesses differentiate their product or service, get the attention of the right target market and persuade consumers to convert on their offering? Were you expecting a definitive answer? Sorry. There is no magic bullet solution. In response, some companies turn to unsavory marketing techniques to capture their web traffic’s information or enable their own future marketing opportunities. When we say "unsavory marketing," we are not talking about stealing contact information or doing anything illegal. At its core, what we mean is misleading consumers. What we mean are the little things that can erode the relationship between marketers and customers and can end up hurting your business in the long-run. The impetus for this topic came when booking a hotel room last week. Do you notice anything in particular from the screenshot of the booking process below? No? At first glance, neither did we. Everything on this booking summary page flows nicely, funneling the user to bottom of the page to confirm. Conveniently nestled in between the hotel policies and the booking confirmation is a Notify Special Offers section. Now there is certainly nothing wrong with asking your customers to opt-in to your promotions, or even encouraging them to allow promotions from your partners if they so choose. The problem is with how this information is presented. You have seen an opt-in checkbox before. They look like this. While there is no law stating that a checkbox needs to look like this, it has become standard practice for most online marketers and something consumers have learned to expect. 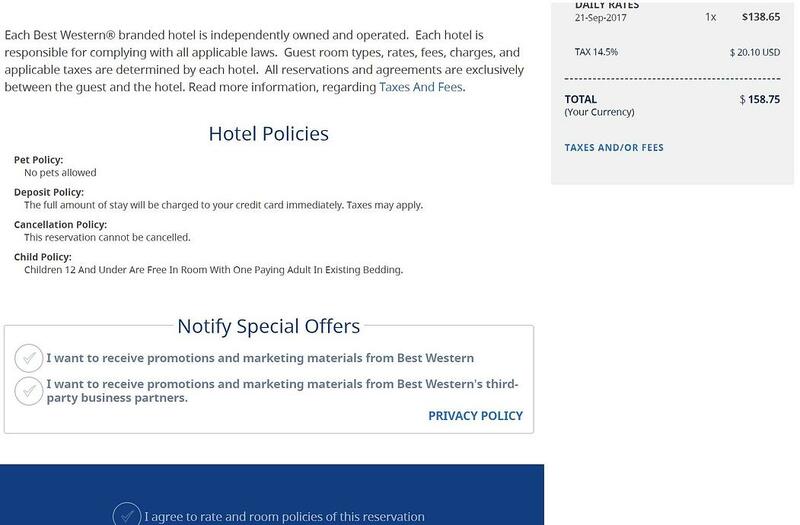 In contrast, Best Western’s special offers section appears to have been built to blend in with the page, giving no indication that action is required of the consumer. Furthermore, these options are pre-checked meaning that, by default, all consumers are opted into not only Best Western’s promotions, but the promotions of any of their third-party business partners. In order to decline the promotional opt-in that the user never asked for, they need to take action in a section of the page that, in my opinion, appears to be designed to blend in. So what? I don’t run a multi-million dollar company, so why does this matter? We presented this hotel booking use case to show a real-world example of a well-known brand undermining the choice of the consumer. It happens. This certainly is not the only (or most egregious) example of unsavory marketing techniques, but that does not mean that lead generation companies (or any business for that matter) should attempt something similar to boost their opt-ins or lead generation efforts. Along with potential legal risks involved, you put the integrity and value of your business at risk when you try to deceive customers. For lead generators, this example is even more important. While a hotel conglomerate can try to further monetize its customers by enabling its own promotions, a lead generator’s entire business revolves around handling consumer information so the repercussions for misleading them is amplified. Luckily, the solution is simple. Always think about what is best for the customer. It is that easy. 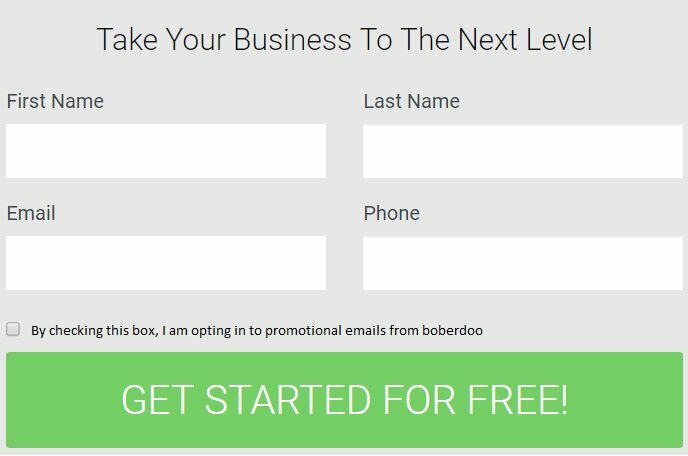 boberdoo has been innovating and improving the lead generation industry since 2001. We have seen just about everything there is to see when it comes to online marketing and lead generation. We have worked with hundreds of businesses over the years and it is no surprise that those who look out for the customers are the same ones that have been around the longest and have found the most success. If you are interested in learning more about boberdoo or how our software continues to help lead generators run their businesses, please give us a call at 800-776-5646 or fill out the form below.